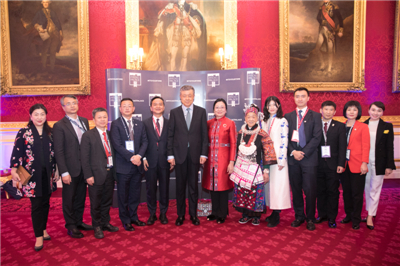 On the evening of December 12, Ambassador Liu Xiaoming was invited to attend the “Pitch@Palace” Global 3.0 held at St. James’s Palace in London. HRH The Duke of York attended and addressed the event. Entrepreneurs from 15 countries including Pony.ai, YI Tunnel, and China Craftsmanship pitched in the “Pitch@Palace” global final. More than 300 people from the science, technology and business sectors of various countries were at the event. Bao Ling, Minister Counsellor for commerce, and Jiang Sunan, Minister Counsellor for Science and Technology of the Chinese Embassy, were present. After the competition, Ambassador Liu had a talk with HRH the Duke of York. The Ambassador congratulated him on the success of the “Pitch@Palace” Global 3.0 and hoped that the “Pitch@Palace” would achieve greater success in the future and contribute to the science and technology cooperation and the “Golden Era” of China-UK relations. 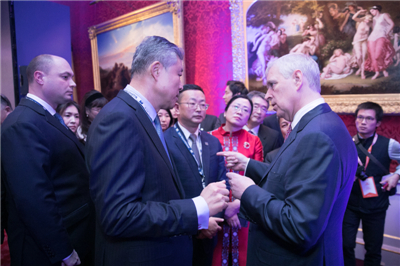 The Duke briefed the Ambassador on the development of “Pitch@Palace”, saying that China's science and technology industry is booming and the technology enterprises are full of vitality. The “Pitch@Palace” will continue to focus on the Chinese market and help China's small and medium-sized technology companies to grow and develop. Afterwards, Ambassador Liu met with the representatives of Chinese companies participating in the event.